JORDAN STATION, ON (April 13, 2006) – It’s earlier than planned, but Carl Spiering will debut the new Eaton Electrical Supercharged 1967 Chevrolet Camaro Pro Modified entry at the upcoming Nicko’s NY Style Pizza 36th Annual Spring Nationals. This event, is the second in the 2006 IHRA eMax Drag Racing Series, and presented by Advance Auto Parts, will be held in Rockingham, North Carolina, April 21-23 at Rockingham Dragway. The 41-year-old Spiering crashed the Carl Spiering Motorsports Eaton Electrical Pro Modified Chevrolet Corvette in the quarterfinals at the Amalie Oil Texas Nationals at San Antonio Raceway March 26 in Texas. The Camaro will be replacing the Corvette. Spiering was taken to hospital after the incident and released the same night with broken ribs, bumps, and bruises. Carl Spiering Motorsport would like to thank the IHRA's safety and track rescue team of emergency medical technicians, paramedics and fire fighters, the on-site physician, and the Brooks Army Medical Center for their help and support. Spiering leads the points chase for the Torco Race Fuels Pro Modified Shootout and had a strong season in 2005. Winning the IHRA Torco Race Fuels Pro Modified Shootout and the IHRA ACDelco Nationals. 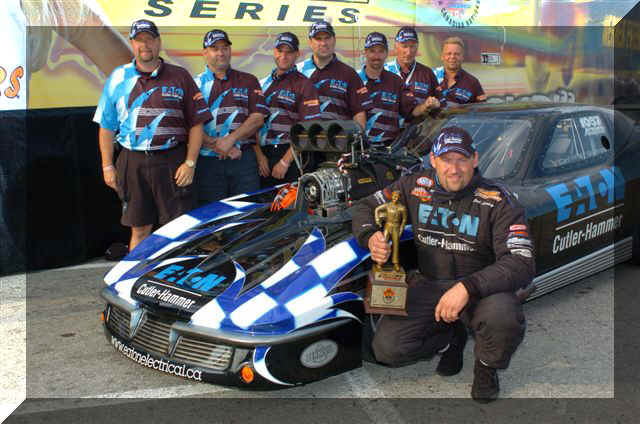 The Eaton Electrical Pro Modified placed third in the IHRA World Championship National Event Tour. With a serious passion for fast machines in any type of competition, Carl Spiering is quickly becoming one of the hottest Pro Modified racers on the drag race circuit. Carl Spiering Motorsports, www.CarlSpiering.com, thanks all of its sponsors and supporters including Eaton Electrical, Aluminum Trailer Co., Competition Tire Canada - Goodyear Racing Tires, ERD (Engine Research and Development), Excel Tool & Die, NGK Spark Plugs, RBS Superchargers, Red Line Synthetic Oil Corporation, SSI Superchargers, (ATC), Bicknell Racing Products (BRP), The Trailer Shop, and VP Racing Fuels. The International Hot Rod Association (IHRA), www.ihra.com has been a leader in sanctioning drag racing events in the United States and Canada since the organization was formed in 1970. The IHRA features 13 classes of competition including the Torco Race Fuels Pro Modifieds. It provides drag race fans the opportunity to experience the popular Pro Modifieds, known as “the world’s fastest door slammers”. This class is one of drag racing’s most exciting and volatile classes, capturing the true spirit of hot rodding and offering a wildly diverse group of racecars with different types of 2,000 -horsepower engines. Combining classic body styles and modern equipment, constructors are permitted to extensively modify and enhance both appearance and performance. Competitors are offered the option of supercharging or adding nitrous oxide injection to the power plants. The cars burn gasoline or methanol propelling them down the quarter-mile in low six-second times at over 225 miles per hour. The displacement limit of 740 cubic inches remains on non-supercharged engines while supercharged versions face a ceiling of 527 cubic inches. Minimum weights include 2,375 pounds (nitrous) and 2,700 pounds (supercharged). The Pro Modified field is composed of the 16 quickest teams from the qualifying rounds. Eaton's Electrical Business (Canadian Operations) is a global leader in electrical control, power distribution, and industrial automation products and services. Through advanced product development, world-class manufacturing methods and global engineering services and support, Eaton's Electrical business provides customer driven solutions under brand names such as Cutler-Hammer®, Powerware®, Durant®, Heinemann®, Holec® and MEM®, which globally serve the changing needs of the industrial, utility, light commercial, residential, and OEM markets. MARION, TX (March 26, 2006) – Carl Spiering’s day ended abruptly Sunday when he crashed the Carl Spiering Motorsports Eaton Electrical Supercharged Pro Modified Chevrolet Corvette in the quarter finals at the Amalie Oil Texas Nationals in the International Hot Rod (IHRA) eMax Drag Racing Series at San Antonio Raceway San Antonio, Texas. In the second round of Torco Race Fuels Pro Modified eliminations, Spiering, 41, of Jordan Station, ON took on number six qualifier Kenny Lang from Grande Pointe, MB with a 1953 Chevrolet Corvette. Lang had the quicker light and was out in front at the 660-foot marker. But after that, Spiering pulled ahead and was out in front when they passed the 1,000-foot marker. Spiering's car drifted left out of the groove and came close to hitting the outside wall of the left lane. As he tried to get back into the groove, Spiering crossed over the center line after the finish line, running over to the other side of the track and hit the wall on the outside of the right lane. The cars did not hit but Lang waited to deploy his parachutes, making sure he got by Spiering's car, and by not getting the chutes open early enough, he coasted into the sand at the end of the track. Spiering ran a 6.299-second, 207.98 mph pass for the win. With his car crossing the center line after the finish line, he was declared winner of the round. Spiering was unable to make the call for the semi final round, which gave the win into the finals to the 1963 Corvette of Tommy D'Aprile’s from Port Charlotte FL. Spiering defeated Jason Hamstra from Demotte, IN in the first round of eliminations with a 6.179-second, 231.64 mph run. Hamstra was in the field as an alternate for number two qualifier Scott Cannon Jr from Lyman, SC who Spiering was scheduled to run before Cannon crashed in the final qualifying session Saturday night. Glen Kerunsky from Priddis, AB won the Torco Race Fuels Pro Modified Championship at the Amalie Oil Texas Nationals over Tommy D'Aprile from Port Charlotte, FL. With a serious passion for fast machines in any type of competition, Carl Spiering and his Carl Spiering Motorsports Eaton Electrical 1963 Chevrolet Corvette Supercharged Pro Modified is quickly becoming one of the hottest Pro Modified racers on the drag race circuit. In 2005, Spiering had strong season, winning the IHRA Torco Race Fuels Pro Modified Shootout and the IHRA ACDelco Nationals. The 41-year old placed third in the IHRA World Championship National Event Tour. The Carl Spiering Motorsports Eaton Electrical Supercharged Pro Modified Tim McAmis Race Cars Chevrolet Corvette is powered by a 526-cubic inch Brad Anderson Hemi power plant with Alan Johnson cylinder heads, a SSI Supercharger, and a Carl Spiering ERD (Engine Research and Development) fuel system, all united to a Lenco three-speed transmission with an Applied Friction Technologies (AFT) clutch. Carl Spiering Motorsports, www.CarlSpiering.com, thanks all of its sponsors and supporters including Eaton Electrical, Aluminum Trailer Co. (ATC), Bicknell Racing Products (BRP), Competition Tire Canada - Goodyear Racing Tires, ERD (Engine Research and Development), Excel Tool & Die, NGK Spark Plugs, Pennzoil Canada, RBS Superchargers, SSI Superchargers, The Trailer Shop, and VP Racing Fuels. The International Hot Rod Association (IHRA), www.ihra.com has been a leader in sanctioning drag racing events in the United States and Canada since the organization was formed in 1970. The IHRA features 13 classes of competition including the Torco Race Fuels Pro Modifieds. 1/6/06 - Eaton's electrical business (Canadian Operations) and Carl "Big Dog" Spiering to renew the Ultimate Power Trip for 2006. After an electrifying season of high speed drama and excitement, Eaton's electrical business (Canadian Operations)announces that Carl "big dog" Spiering will be back for the Ultimate Power Trip in 2006. Spiering, driving the Eaton Road Warrior III Pro Modified Corvette finished the 2005 season with a career best 3rd place finish in the IHRA points standings. Spiering's successful '05 campaign included capturing the ACDelco IHRA Iron Man (Toronto Motorsports Park), 3 Runner-Up finishes (Edmonton, Martin and Rockingham), 1 Semi-Final (Milan), 2 Quarter Finals (Norwalk and Epping)and 2 Top Eight Finishes (Grand Bend and Budd's Creek). Without question the highlight of Spiering's 2005 season was winning the prestigious TORCO Fuels Pro Modified Shootout held in Martin, Michigan. Heading into the 2006 season, Carl Spiering will retain the Number 1 Qualifier position by virtue of his '05 win. "We're extremely pleased with the results of our 2005 season," says Rob Conway, Construction Marketing Manager. Carl and his crew have established a new performance standard and as we prepare for the 2006 season, we're extremely confident that the team will continue to achieve success in the new year." Added Steve Boccadoro, National Marketing Manager, "there's no question that we've found a successful marketing formula in a form of entertainment that our customers have found extremely exciting. There's a certain fascination with the automobile and when you add in elements of speed, burning rubber and the unexpected, it truly becomes a potent blend for maximum entertainment value. Carl and his crew have exhibited a personal commitment towards excellence and teamwork that has rewarded us with victory, on and off the track. We're overwhelmed by the continued support of our Customers and Distributor Partners. Their involvement and support in this major initiative is critical to its success." Adds Spiering, "all of the team players from Carl Spiering Motorsports are excited once again to have the opportunity to travel and represent Eaton's electrical business for another year. We had a great 2005 season with many personal bests. It's going to be a challenge to improve on that but we're going to continue to work hard. The team is already working on some engine research to find more power which will give us an edge on our competition. We are looking forward to doing some early testing and racing not only in the IHRA, but select PMRA events and Tracks which will serve the marketing needs of Eaton's electrical business." Eaton's electrical group would like to thank the IHRA, Participating Tracks, Volunteers, our Distributor Partners and Customers of Cutler-Hammer brand products for their continued support.